Looks like I’m super creative lately. I’ve had another idea to improve libdepixelize. The idea is to use the knowledge I got from the compilers course on the Coursera MOOC platform to make libdepixelize implement an abstract machine that can be programmed through image metadata gathered from PNG files to execute arbitrary code to turn libdepixelize into a generic cg framework. In fact, I’m so excited about this idea that I’ll start to work right now and I’ll try to deliver this feature at the end of this very week and you can wait for some extensions in the next week. In the list of planned extensions, there is support for examining your computer usage, then we can gather general info about our citizens and help the police chase criminals. But don’t worry, we’ll only use this info for the good. I’ve invested some effort to improve libdepixelize response to evil patterns. Because libdepixelize won’t discard color information, the connections of the similarity graph aren’t a transitivity relation and extra topological patterns can happen. I refer to the extra patterns as evil patterns. The name comes from the fact that I enjoy to play Zelda and defeat the evil from the Hyrule land. Same happened in the last libdepixelize’s commits, where I overcame some patterns to improve the output quality. Quality can be something subjective sometimes, then I was a little conservative and limited my changes to things that I could reason about. The effort end up in new samples to the libdepixelize documentation, new rules for the algorithm and its related documentation and lines of code in libdepixelize itself. The new rules are added as an extra step on the process. They are not treated like the Kopf-Lischinski’s heuristics to resolve crossing connections. I think maybe would be possible to get some of the new rules and describe versions that are more general and can be added to the “container” that holds the old heuristics. To make this happen, I’d need to define the concept of “similar color” as a set and operations on top of the set, the notion of interval and other things and logical reasoning on top of all that. A bit of mathematical work to improve the quality a little more, but I wanna to investigate the use of La*b* colors (an old suggestion by Nathan) to replace the current concept of “similar colors”. I didn’t replaced the current space color until now, because YUV and La*b* behave differently and I couldn’t just convert the YUV constants that define the boundary between dissimilar colors to La*b* to achieve better results. The current YUV constants were taken from HQx filter and I need to define a methodology to find new constants. The advantage of a rule that is more general and unifies behaviour is just the beauty of a simpler rule that handles the real problem, as opposed to several branches that are consequence of the real problem. It’d abstract the nature of the problem better. It’d make the code simpler. It’d handle more branches. Being a single rule that affect more branches, it’d be easier to test and better at convincing me that the improvement is real and there will be no loss of quality in other images. It’d be interesting to investigate the range of voting in all heuristics and try to come up with “fair” multipliers/strength. Previously I used a technique to carefully insert new nodes to obey the technique “adjust splines” from the Kopf-Lischinski paper while being limited by the old splines representation. This technique has caused troubles to several later steps. The first problem was to remove the extra invisible nodes that are present in the output SVG. These extra node not only make the output larger and make rendering consume more CPU time, but also can be troublesome for artists wanting to manurally edit the generated image. I’ve made several unsuccessful attempts to remove these nodes and I’m sure it’s possible, but I’ll try to move away from this problem trying a completely different approach to the problem. The second problem is similar, in essence, to the first one, described in the paragraph above. When I originally disabled the optimization step in the Inkscape GUI and marked it as experimental, one of the reasons was because it required “extra preprocessing steps” (it was a pretty vague explanation, but I should try to improve my communication skills). With no extra invisible points, the optimization step will be way simpler. The step related to optimization that avoid overlapping shapes and holes will partly go away and the approach I mentioned previously (“A new idea to keep the shape of optimized splines correct“) will be affected. The idea is to split splines. I was previously using a list of points. The new idea is to use a list of splines, where spline itself is a list of points. I hope that the new representation will allow a representation closer to “arbitrary”, just enough to apply the operation “adjust splines”. The new representation should do without extra points and easy the last processing steps (in terms of processing power and my productivity). Of course this change requires a lot of refactoring and will take a bit of time to be finished. Also, the “hope” word used previously means that I haven’t thought about all implications and I’m sharing this idea very early. I’m trying to improve my communication skills and this means that you’ll see some “flood” on this blog. The “flood” might include ideas that eventually prove to be bad at a later point and doesn’t hit the libdepixelize code. After I shared some images on Google+ related to libdepixelize improvements, some people demonstrated interest in helping me with beta testing. First, the software is free software, then anyone can use it (even the development versions). So, if you find a crash or something that obviously is a bug, fill a bug report and I’ll fix it. Second, I still want to improve the quality of the algorithm, then a good pixel art database can help me a lot. Currently the algorithm behaves bad at images with too many gradients, but this doesn’t mean that a lot of images with gradients will help me to improve the quality of the algorithm. I need to publish a page explaining what kind of image can help me to improve the quality of the algorithm. Third, you can help me with profiling info to improve the performance of the algorithm. I’ll probably send a message to the Inkscape mailing list with the title “request for beta testers/profiling data on libdepixelize”. I’ll probably (re-)share the message through Google+, this blog and maybe more. If you follow any of these communication channels, you’ll know when I need help. This image already is highlighted on the algorithmic documentation report anyway and is unique enough. I’ll have a test at the end of the week and later I’ll share more of my time to play with POWER and LLVM. Then libdepixelize will have to wait a little until I can do more commits. I’m aiming to deliver all the improvements related to the original Kopf-Lischinski algorithm before Inkscape 0.91. Later I’ll try to improve performance. “Beyond Kopf-Lischinski” extensions have no timeline and depend on creativity. Lots of months without updates, I thought it was about time to post something. Interestingly, this is the post that document the slowest progress, but it was the post that consumed more from my time. 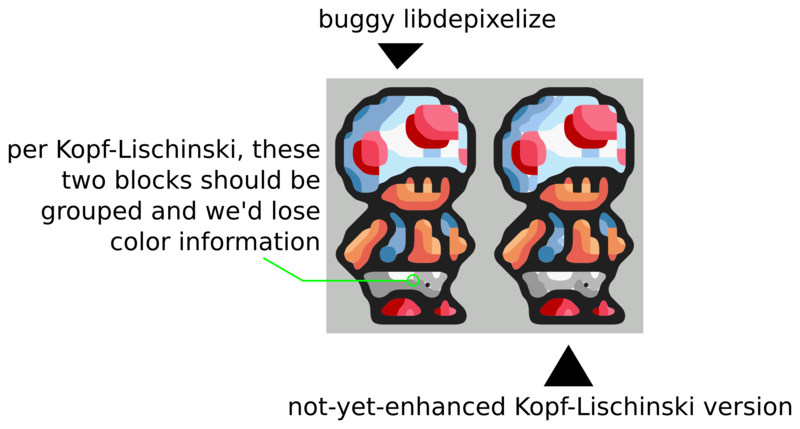 I found an awesome pixel art database distributed with the Frogatto game and from now on I’ll use it on my research and tests. The license is kind of confuse (you don’t know precisely all the things you can do) and I’d prefer a Creative Commons license, but it’s safer (for me) than use copyrighted graphics from Nintendo or other companies. Not only the license is better, but also the beauty of these graphics is outstanding. Most of the images don’t have an Alpha channel and use a placeholder color as the removable background, but there are some images where real use of Alpha channel (not only on-off) is there. I want also to add that I liked the Frogatto game so much that I was thinking about the possibility to join forces with their developers to provide a hi-rez version of the game using the Kopf-Lischinski algorithm. Maybe I can borrow some processing power from some cluster at my university to generate the SVG files. If you’re unfamiliar with Kopf-Lischinski heuristics, I suggest you to read the “trace pixelart” manual bundled with the very (bzr) latest version of Inkscape. Do you know how a good a conversion from current libdepixelize would be? Well, it would generate a similar image as output, but a an alpha channel heuristic wouldn’t help. Also, there aren’t really any cross-connections to resolve here (because the alpha channel + extra color patch turn each one of the white pixels into different colors/shapes). Even if there was an ambiguity in the similarity graph, I don’t see how an alpha channel heuristic would help (mainly because the lack of problem hurts my imagination). The image is ugly and the reason is because I created it. It’s so ugly that maybe you don’t understand what drawing I tried to achive here, then I need to explain. The drawing is a part of a chain. There were chain images on the Frogatto database, but they weren’t affected by the issue I wanted to mention. The image squares are pixels and the image was magnified 12x. The Alpha channel information is still there. The other heuristhics (long curve and sparse pixels) will likely vote to keep the chain shape, then the result is already good and there is no need for an Alpha channel heuristic. 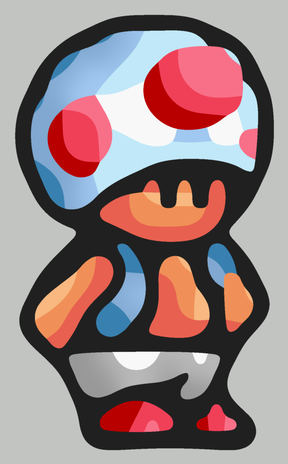 Also, it’s possible (but very unlikely) that the transparent color has random bits that will create no connections and won’t affect the chain shape. Well, pretty much an Alpha channel heuristic is useless, but kind of nice to have as an extra safety over the other heuristics. But I won’t create this extra safety guarantee, because the above image is artificial (you won’t find it in any game) and I haven’t find a good Alpha channel database affected by this issue yet. If I do find such database, I can reconsider this issue, because even if the heuristic go wrong for some images, the libdepixelize design allow you to disable or invert any heuristic (neat feature). Just to be clear for once… I won’t waste my time looking for a pixel art database making good use of alpha channels affected by this issue. I don’t even bother anymore. But… if you do find such database, just share it with me and I’ll see what I can do. In fact, this is one of the changes in libdepixelize where I don’t need to invest much effort or thought (apart from the pixel art database research). One of the things that I’m really failing to achieve is to keep the shape of optimized splines correct. I had a new idea that I want to test soon and I’ll describe in the text below. So, the idea is to create an index of all points that share the same position before the optimization begins. 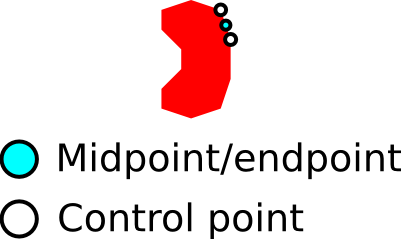 Every time a point is optimized, the position for all points sharing that position change. The problem is, among others, to keep invisible lines invisible. The approach is simple, but it’s a bunch of code to do. Stay tuned. The post is getting kind of big, then I’ll leave analysis of one possibly interesting algorithm for later. This was a task originally suggested by Nathan. I think he meant to use Valgrind, but I went on a different direction and I went on LLVM suite (clang sanitizers) instead. First test is simple and it didn’t show much. This was done using clang static analyzer tool and theoretically can be as good as the compiler warnings. The output was “No bugs found.”. Second test was the combo address sanitizer+leak detector, also using LLVM tools. I fixed some bugs regarding the use of the popt command line arguments parsing library and suppressed another warning (source outside of libdepixelize cannot be fixed within libdepixelize). 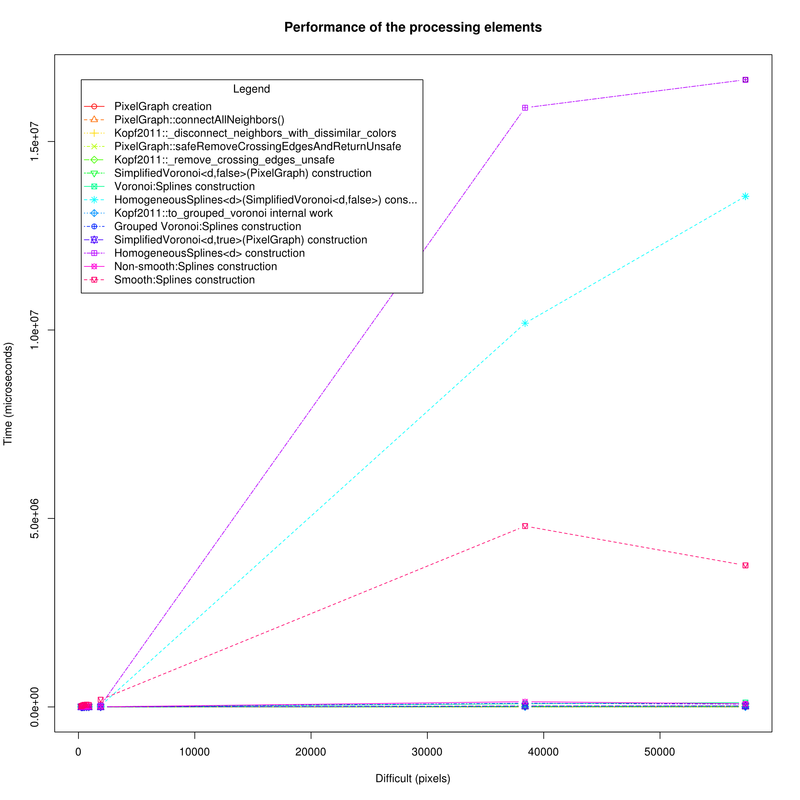 Looks like the use of RAII helped to keep libdepixelize free of memory leaks and the use of standard containers instead self-made structures helped to keep libdepixelize free of wrong-address errors (although I do some weird pointer arithmetic at some places to try to improve the performance, but the analyzer hasn’t spotted errors). Third test was the memory sanitizer, that would help to spot the use of non-initialized variables, but this sanitizer aborts on the first error and due to an error within popt I couldn’t go farther. I tried to use the suggested attributes and also the blacklist file, but it didn’t help. In short, I’d need to rewrite the binary without popt to inspect libdepixelize code through the memory sanitizer, then I’m postponing this task. At least the next planned big refactor is more sensible to addresses, which has a sanitizer working fine. I tested all output modes (voronoi, grouped voronoi, non-smooth and default). The set of images used was chosen to increase the test of code paths executed, including the images that are used as examples in the original paper to describe the heuristics and smoothing techniques and some big images taken from real-world games just to stress the code. Something better would be some unit tests. This set of image was used for all tests described in this post. This was also a task originally suggested by Nathan. The task was not to find the slowest element in the processing pipeline, because maybe the element is the slowest, because indeed the task is tough and it may be doing the best possible. The task was to find which processing element wasn’t scaling linearly with the size of the input and improve it. I haven’t measured memory consumption like old Rasterman told us, but memory consumption isn’t my focus with libdepixelize. I use a templated argument to customize the precision and you can “freely” (actually it’s limited by 2geom) use any type (float, double, long double, …) you think fits your application the best. I try to avoid cache misuse and too many allocations and memory usage is just a consequence of this design principle. Thus, don’t expect any changes focused on memory consumption. Memory usage may receive some love, but just as a mean to achieve better performance. Also, this isn’t the kind of application you hope to keep around and you just want to see it finishing fast. A last thought is that structuring packing could decrease memory usage without affecting the algorithm, which can improve the use of the cache and the performance. You can find the result below (libdepixelize profiling output + zsh + python tricks) and the method at the end of this section. The image was generated using R.
And below, you have a plot of the same data using a logarithmic scale to move away the curves from 0. I’m sorry for being that n00b, incapable of producing a legend that don’t cover parts of the curves. Now it’s clear what processing units I need to investigate to improve the performance. 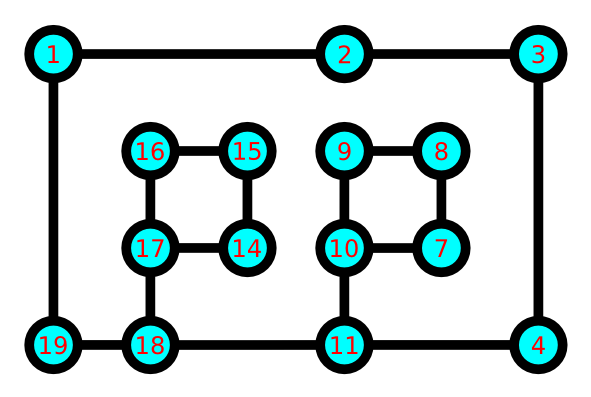 One of the ideas to improve the performance was to use a cache oblivious algorithm. This means that I should use a different memory layout to make better use of cache. I wanna know what kind of improvement I should expect and I did a small test converting a large image to a single row and did some measurements (you can find a code snippet below as a proof), but the libdepixelize’s code take different paths and the comparassion is very unfair (to not say useless). I will do a second approach mentioned in this blog post to measure cache misuse. I’ll have to implement the new memory layout and compare the results to be sure about the improvement. Before comparing the results, I’ll have to rerun the old tests, because my computer will be using newer libraries and newer compilers and the comparassion wouldn’t be fair. Let’s define a run as the execution of the script below (given that libdepixelize was configured with the option OUTPUT_PROFILE_INFO enabled). I did 3 runs and aggregated all common values per image (even equal steps in different output modes, like “Tracer::Kopf2011::_disconnect_neighbors_with_dissimilar_colors(Tracer::PixelGraph)”, with exception of “Tracer::Splines construction”, which would be unfair). I discarded the largest (the slowest) value for each field per image, because I was considering it as cold cache effect and it’s more difficult to measure/replicate this condition (I’d need to learn how to clear the cache without rebooting the PC), then I’m more interested in hot cache condition. Then, I computed the arithmetic mean. Now I have a table of values to print for a set of images. I’d like to compare the time taken by some processing element (this is how to interpret each value) as the “difficult” increases. The difficult was related to each image and to rank them I just sorted them by number of pixels. I ran all the tests on this machine and I kept myself from using this machine while the tests were being executed. Yes, not a very “scientific” approach, but I think it’s on the right track and I need to reserve some time to development. 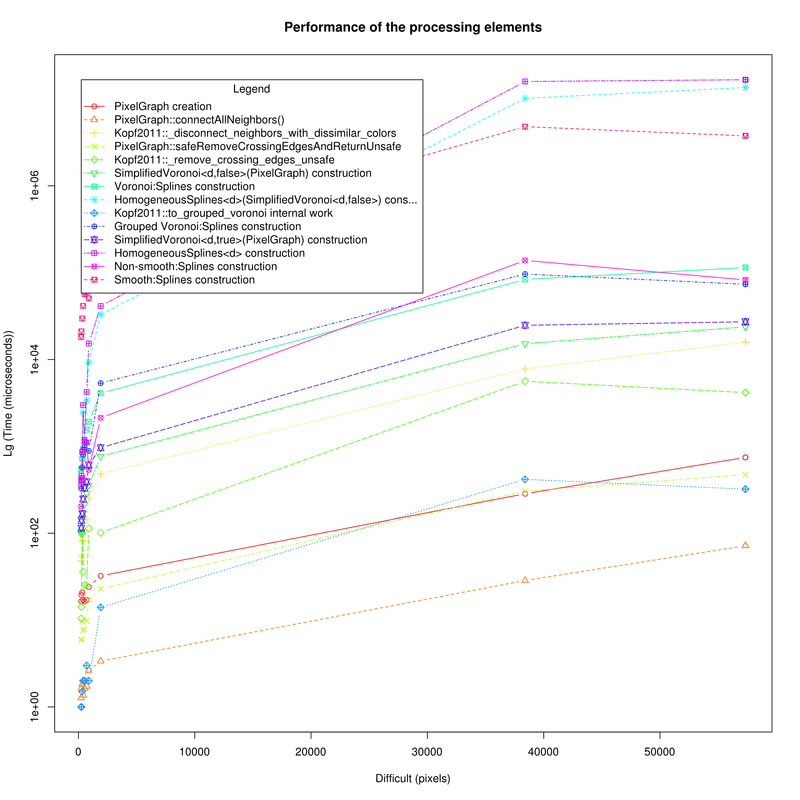 The purpose is just to identify the “worst” processing element anyway. GSoC 2013 is over and I thought that I should write an “ending post” for this category. Optimization is disabled by default on Inkscape GUI, because it is in an experimental state currently (the harmonic maps triangulation is not implemented and some required preprocessing steps are buggy). You still can use the libdepixelize’s command line application if you want to play with the experimental features. I’m finishing the final bits for a polished result regarding extra color information (this feature is beyond Kopf-Lischinski original algorithm) and then I’ll polish the Inkscape integration a bit more (processing in a background thread). The “new beginning” text on the post title comes from the fact that I’ll continue to work with my mentor to improve the Kopf-Lischinski algorithm. “Polished result regarding extra color information…” is finished. There is one very minor issue and a minor improvement (there will always be), but they can wait a little longer. Enjoy it! Should I really target Kopf-Lischinski? Before vote and choose any option, know that this ain’t democracy and I don’t promise to follow the winner, but I’m interested in the popular option because I care. Also, before vote anything, read the rest of this post to understand the consequences of each choice. The output from the left is buggy by Kopf-Lischinski and my own standard. If this result were correct, then it should group these two gray blocks in a single block and I should code a bit more to make sure this happen. The output from the right is “innovative” and I’m coding since the beginning to preserve as much color information as possible and I don’t need to fix anything, but I need to extend Kopf-Lischinski algorithm to handle the “unfilled” space between two (non-)grouping blocks. The result wouldn’t be Kopf-Lischinski, but it’d preserve more color information and if Kopf-Lischinski algorithm is ever going to be patented, we’d have a different algorithm (partially patent-free). The algorithm remove color information to simplify the vectorization process, but I came all this way without being limited by its “not that much increased complexity” and I think I can extend the algorithm to include descriptions of how to handle more color information in these final steps. If you think the “non-enhanced” version would be easy to implement, it’s because you haven’t thought about any image where a gradient is present. Close blocks of colors would have similar colors, but distant blocks would have different colors anyway, so there is not an easy way to choose which blocks should be grouped. Most of the ideas I thought about (since the beginning of the project) would have different results depending on the “iteration order” and as such I consider this a too “fragile”/unstable algorithm. The only “correct” solutions I can think of at the moment are too expensive and based on the benchmark present in the paper, I doubt them were chosen. Keep in mind that any path I choose will bring me code to produce.